You are here: Home / Ethnic Groups / The People of Sulawesi / Who are the Moronene? The Moronene are part of the Eastern branch of the Bungku Tolaki micro group which originated in Central Sulawesi. In many districts, they live together with the Bugis. Their language is part of the Eastern Bungku-Tolaki language group which also includes the Mori, Wawonii, Tolaki and Waru languages. The Moronene area is known as the Negeri Dewi Padi (the land of the rice goddess). This name is based on a myth. It depicts the area as a place with agricultural fertility that brings prosperity to inhabitants who are creative and want to work hard. However, if the Moronene community continues to depend on the generosity of nature and doesn’t accept social change, they may find their socio-economic status in decline. The Moronene have always been known for highly valuing peace, patience, and simplicity. As a result, whenever they are engaged in conflict with another party they will always choose to concede, thus allowing them to remain in the same area. They live very simply and are happy to live in a small group. Their houses are mostly made from bamboo. If they must go look for a new place to live in order to avoid conflict in their original location, they build their new homes in a different location to avoid more problems. Although research has not yet proven this, it appears the above cultural traits are passed on from generation to generation, forming the basis of their politics, economy, social life, and customs. 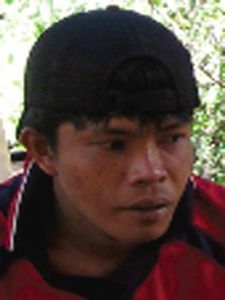 In the Rumbia area, one Moronene community lives in an area designated as a national park. As a result, they have not been treated well by the government. They have been evicted from their homes because their land is now protected forest. This has caused social conflict between the community and the government. However, they are not without outside assistance, as they have been supported by community development organizations and others. In 2007, gold was discovered in the Bombana Regency and a gold rush ensued. This caused an influx of many outsiders into the Moronene area. While many Moronene went to the goldfields to search for gold, much of the wealth went to outsiders, and the gold rush caused a number of social problems. Sunni Islam has been the dominant religion since the 1600’s. However, traditional beliefs are still very important, especially the belief in evil spirits. None of the Moronene can now be classified as isolated groups. They all live in villages, or in farms on the outskirts of villages. Some have animistic beliefs mixed with their Islamic beliefs, but all of them identify themselves as being Muslim or Christian. Better education and health facilities are the primary needs of the Moronene. They also need training in order to increase the productivity of their land and their standard of living so they can compete with the transmigrants in the area.